Next season, as our players change, we may use other plays and options. Use those that will best benefit your team. Don't overload your players and try to teach too many of these at once. Also see the 4-Out Low plays. The following plays are used in conjunction with the 4-Out "High" set, i.e. with our post player playing at the high-post (free-throw line area). In teaching our 4-Out system, we first teach the basic offense, and then add a few of these plays as the season progresses. Here are several set plays that you can run out of the 4-Out "High" offense: Topside and Counter, Flash, Slip, Swing, Fist, and the Weave-Screen Plays. These two plays may work well against teams that like to full-front our post player. Both of these plays could actually be run out of the basic 4-out motion offense, without being called a specific name. They could be taught in the context of simply learning how to read the defense. "Topside" is a very simple play, but oftentimes simple plays work the best, if the executed correctly. Our post player O5 moves up to the high post, and if full-fronted, seals the defender, and cuts to the hoop for the over-the-top lob pass and lay-up (diagram A). Notice that O4 back-screens for O2, mainly to occupy the weak-side, helpside defenders. In diagram B, notice that O5 is being full-fronted in the high post. Instead of the lob pass, we pass into the corner as O5 seals the defender and then cuts to the hoop and receives the pass from the corner for the lay-up. If O5 is being half-fronted, we start the play with the ball on the top, opposite O5. Then as the ball is passed around the perimeter (eventually to the corner), O5 seals and again rolls to the hoop for the pass and lay-up. The diagram shows two perimeter passes, but O2 could skip-pass directly to O3 in the corner if that pass is open. If the perimeter passes are being denied, you could have O3 back-screen for O1. O1 then flares to the corner for the skip-pass from O2. Again, notice that O4 back-screens for O2, mainly to occupy the weak-side, helpside defenders. Start with in the 4-out, 1-in offense with O5 low on the opposite low block. O5 makes a flash cut to the free throw line and receives the pass from O1. Meanwhile, as O5 is receiving the pass, O4 fakes out and then makes a hard quick back-cut to the hoop. 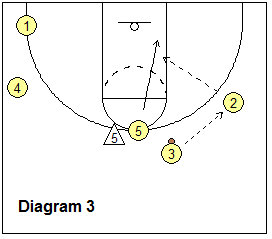 O5 passes to O4 for the lay-up (diagram A). If O4 is covered and doesn't get the pass from O5, he/she continues through and sets a back-screen for O3. 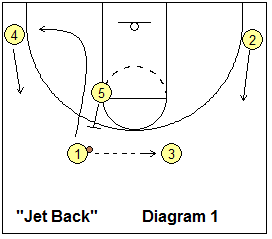 O3 cuts around the screen and gets the pass from O5 for the lay-up (diagram B). If the defense switches on the screen, O4 should have inside position (after sealing the defender). O3 clears to the opposite side and O4 rolls to the hoop for the pass from O5 (Diagram C). Of course O5 could take the shot from the free throw line, or make a dribble-drive to the hoop as additional options. The weave screen (or "W") plays are simple hand-off plays that can free up a perimeter player for either an outside shot, or a dibble-drive to the hoop. The diagrams below show a 3-out, 2-in set, but these plays can also be run with the 4-Out and 5-Out sets. Below we see "W2", where O1 dribbles at O2 (diagram A), hands the ball off to O2 and screens the X2 defender. O2 comes around the screen for a 3-point shot, or a dribble-drive to the lane (diagram B). "W3" would be the same play, but run at O3... O1 dribbles at O3, and O3 gets the hand-off and shot. "W4" would be the same play as "34". This play comes from coach Jesse Shaw. It is a great "counter" play for when the defense hedges or jumps out over the ball-screen. Diagram 1 shows a 4-out set with O1 starting on the left. O1 passes to O3. O5 back-screens for O1 and O1 cuts to the weakside block and out to the left corner, as O4 rotates up. O2 slides up to the ballside free-throw line extended spot. After O1 cuts, O5 then ball-screens for O3 (diagram 2). Notice that in diagram 3, the X5 defender jumps out over the screen to prevent O3's dribble-drive. Instead, O3 passes to O2 and O5 slips the screen and cuts to the hoop for the pass from O2 and the lay-up or dunk. This pass is usually an over the top "air-pass" or slight lob.